The MegaWhales’ Mike Maggio scored four goals. 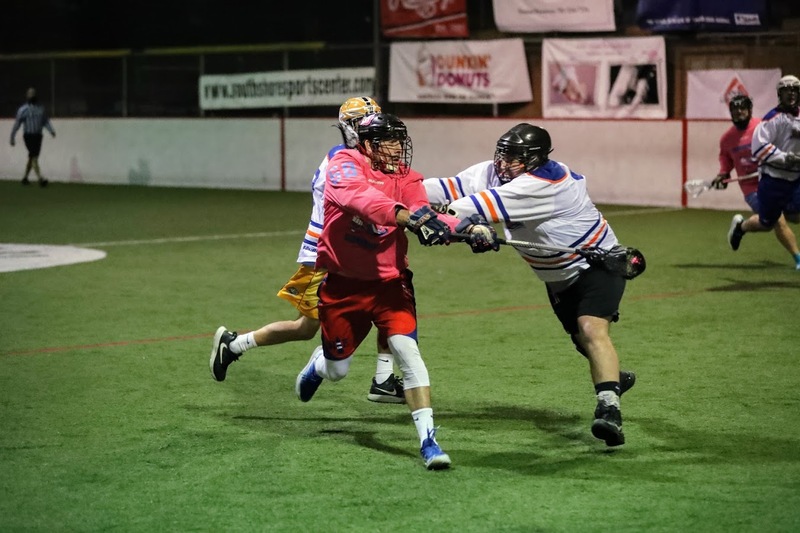 The MegaWhales – buoyed by four goals each from Mike Maggio and Greg Melaugh – continued to rebound from a disastrous start to the Boston Box Lacrosse League season by taking down the Minutemen 13-10 in Nov. 27 action at South Shore Sports Center in Hingham. The Whales’ second consecutive win after losing all of its games during the first trip through the league puts the veteran team back in the middle of the playoff hunt and ties up the season series against the Minutemen and ensures that the teams’ third meeting in January will go a long way toward determining who reaches the playoffs. In the nightcap, the unbeaten Bullseye ran off to a 12-5 lead and then held off a resolute Blazers team to strengthen its hold at the top of the standings. The MegaWhales opened the contest with the Minutemen without the regular left side of their offense, namely Melaugh and Maggio, but still got off to an early 2-0 lead on the strength of goals from A.J. Carpio and Sean Condrick. From there, however, Maggio and Melaugh seemingly answered everything the Minutemen could muster. Creating the Whales’ 4-2 halftime lead and then racking up the team’s first four scores of the second half to stretch the edge to 8-5 midway through the second half. Two straight goals from the Minutemen’s Will Jennings – currently the league’s top goal scorer – made it a one-goal lead with 11 minutes remaining in regulation, but that was as close as the Minutemen would ever get, as Dan Hettler and Carl Walwrath scored just over a minute apart, and with Garrett Curran netting his first goal followed by Maggio’s last two as the game broke open before a few too-little/too-late scores from the Minutemen. Aside from the lefty forwards, the MegaWhales got a one goal, three assist night from Dan Hettler, plus multi-point nights from Carpio, Curran, Condrick and Sam Houston-Read. Chris Hettler made 24 saves to backstop the win. Jennings led the Minutemen with three goals and two assists, but Rob Murray, Ed Doherty and Ryan Murphy each scored a pair of goals and Nick Black contributed three helpers. In the nightcap, the Bullseye had six different players score in the first half – but saw Will Walker net four goals by himself – as they raced out to a 9-3 lead. Two late Blazers’ scores – one each for Garrett Naimie and Marty Bowes – made it 9-5 at the break, but when Walker and Charlie Fay combined for three straight goals, it appeared the rout was on. That’s when the Blazers’ defense showed up; they held Bullseye’s forwards scoreless the rest of the way, limiting the league’s most prolific offense to just one goal – a length-of-the-floor, fast-break give-and-go that defender Rob Haus worked with Joe Nardella – over the final 19 minutes of play. Meanwhile, the Blazers offense got three goals from Kyle Baker and a goal and two helpers from Brandon Dube as they fought their way back into the game. Bullseye’s goalie Rachel Vallarelli made two key saves down the stretch that allowed Bullseye to escape with the victory. Walker’s five goals and Fay’s hat trick paced Bullseye, but John Uppgren contributed a goal and four assists and Kyle Smith, Beau Wood, Adam Fishman and Haus all had multi-point nights. Vallarelli finished with 21 stops. The Blazers got five points each from Dube and Bowes, plus four goals from Baker and multi-point nights from Naimie and Greg Rogowski. Most important as the team fought back into the game were the 28 saves racked up by goalie Joe Evans. The winners from Nov. 27 – MegaWhales and Bullseye – square off in the 9 p.m. game on Dec. 4, followed by the Minutemen versus PrimeTime in a game that is critical in the playoff race for the Minutemen, who lost the first match-up between the teams by a 9-3 score.